Francois-Vincent Raspail (1794-1878)is famous both as a political activist and the 'Father of Histochemistry.' In the histochemical field, he was a strong proponent of the use of the microscope to allow visualization of chemical markers within tissues, especially plants. In his work he used three different forms of microscope all described here. He was a strong proponent of the Simple microscope which he preferred over the compound at a time when achromatic compound microscopes were not yet readily available in France. His simple microscopes were sometimes criticized as being inferior to compound microscopes of the time, but one must remember that he had a selection of eyepieces(objectives) which were superior to those supplied as standard equipment with simple microscopes made in France at the time. This may explain the discrepancy between what he reported and what others felt required more sophisticated equipment. As reported by Simone Raspail, Francois's direct descendant who still possesses his microscope2, his microscope is equipped with some optics of tourmaline and also had other special lenses. Tourmaline, with a refractive index over 1.6 (compared to 1.33 for ordinary glass), will have less chromatic aberration than lenses of lower refractive index (like glass). In his own time, only one form of microscope was referred to as 'Raspail's' microscope and that is the first form discussed. The other two were described by him but his name has been inappropriately attached to cylindrical microscopes that only superficially resembles the one he used, as shown below. As far as is known, and according to his own publications, all his instruments were made by Deleuil. Of all the microscopes that Raspail had used, the one that he favored was the one that he had Deleuil modify from the design of Trembley and later, Ellis. The figure from his book is shown to the left. Raspail's Figure 3 shows the Raspail simple microscope; his Figure 2 shows how the microscope could be adapted to carry a compound tube, but is not the usual way it was used by Raspail. Indeed one of Raspail's personal microscopes survives, and no compound tube was found with it. This modification of the 'Ellis Aquatic' design had two features that differed from the original form. First the arm, which was simply pushed forward or backward in the old form, was adjusted in Raspail's model by a worm screw controlled by a knurled knob ('f'). Second, the instrument was fitted with Rack and Pinion focusing, controlled by the knob at 'e.' As I noted in the introduction above, besides these mechanical improvements, Raspail himself had a variety of lenses that he used, apparently of higher quality than those supplied as 'standard equipment,' including some using Tourmaline optics2. 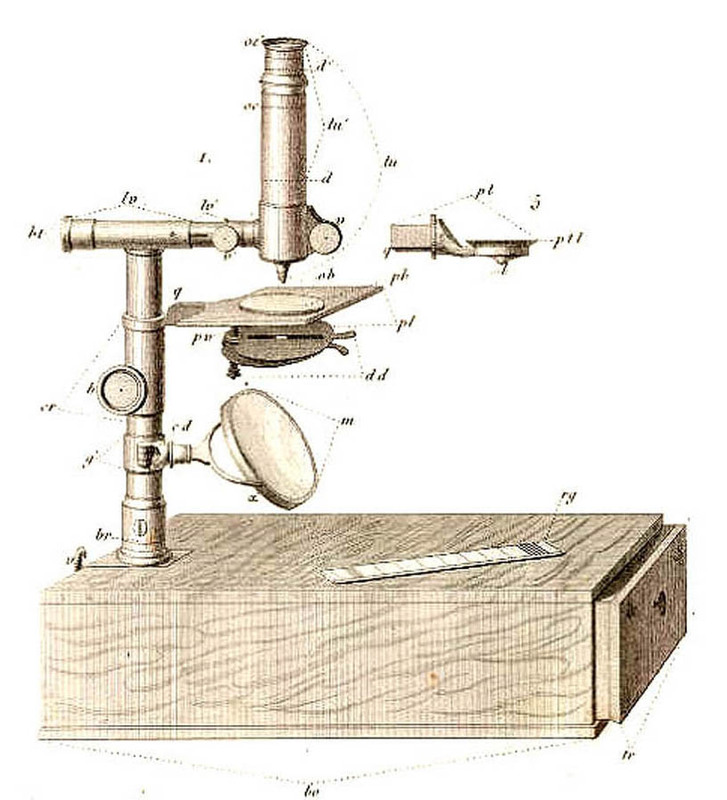 In addition to Deleuil, other makers produced this type of microscope, and one of those was Picart; an example of a Raspail microscope by Picart is in this collection on this web site. Although Raspail had some special lenses at his disposal, it appears that ordinary glass lenses were supplied as standard equipment with the microscope as is illustrated in the example on Allan Wissner's site; Allan informs me these are all clear glass lenses. In this section I will attempt to set the record straight on the original cylindrical microscope described by Raspail in his books and atlas of 1838. Beginning in the 1950's, various microscope historians, perhaps starting with P. Van Der Star, started to refer to a type of microscope with a glass liner as a 'Raspail' type or a 'Microscope according to Raspail.' 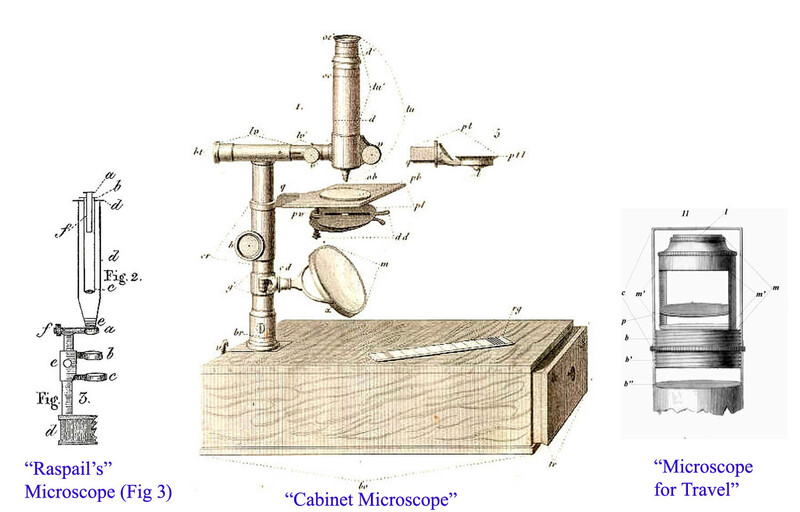 That type of microscope, shown on the left in the figure above, was mostly sold in the last quarter of the nineteenth century by companies like Beck and Queen. Examples of these 'seed or insect' microscopes are shown in detail on the seed or insect microscope page on this web site. They were never attributed to Raspail in any catalog or book of the nineteenth century that I am aware of. It is likely that those that saw the similarity to that one pictured in Raspail's book (image on the right above), did not study the image, or the text of these publications carefully, for they would find that the Deleuil instrument was a bit different. As he described the microscope pictured in the engraving from his book, Raspail explained how this microscope was capable of quality work in the field and how it worked. Important features included that, after being placed right side up, it screwed into a brass case for travel and that it could be screwed onto this case in the upright position, with the case serving as a handle when in use. It allowed light to enter as most of the cylinder was cut away, leaving only two brass supports. In this way it could be used to view opaque objects. He explained how one could also view a transparent or translucent object secured to the stage (by saliva), by detaching the microscope from its case and holding it up to a cloud or other suitable light source. Many of these features are similar to the seed or insect microscope already alluded to, but additional features prove to be quite different. While the Deleuil microscope has a stage, the seed or insect microscope has a glass cylinder inside, with the bottom end of this glass cylinder sealed and the upper end of it in contact with the eyepiece support. This allowed an insect to be trapped inside the 'seed or insect' microscope. The microscope described by Raspail did not have an interior glass cylinder. Instead, inside it had a glass stage plate with a threaded brass edge which matched the threading on the inside of the two upright supports so that rotating it would change its position up or down. As an option, Raspail described a glass cylinder, open at both ends that could be used to cover the outside of the instrument 'to prevent ones breath or the wind from disturbing the specimen' if desired. Another difference was the fact that the Deleuil microscope described by Raspail was apparently supplied with three eyepieces of differing focal lengths and therefore variable magnification. One lens had a focal length of one 'pouce.' The second of six 'lines' and the highest power of one 'line.' These correspond to focal lengths of approximately 27 mm, 14 mm and 2.3 mm (about 1 inch, 1/2 inch, and 1/10 inch). None of the so-called 'seed or insect' microscopes was provided with anything but a single low power lens. I am not aware of any surviving examples of the actual Deleuil cylinder microscope, with an interior adjustable stage. 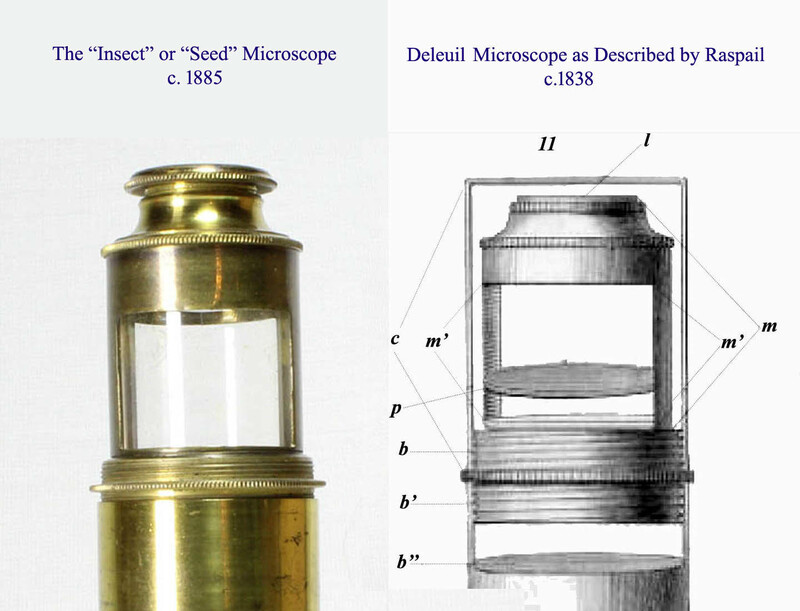 Although there are some features in common, the Deleuil cylindrical microscope Deleuil was a much more complicated and complete instrument than the 'Seed or Insect' type shown to the left above. Deleuil's microscope did not have an internal glass 'cage' but instead had a glass stage, (p in the engraving) surrounded by a brass edging. This stage, or 'object holder,' was threaded on its outer edge to match threading of the inside surfaces of the supports of the microscope, allowing its distance from the eyepiece to vary. This feature, along with a variable focus of the eyepiece itself, allowed a wide range of objects to be studied regardless of their height or thickness. The microscope Raspail described also featured three different magnifying eyepieces, to provide a wide range of magnifications. In the Deleuil model, a glass covering, open on both ends, and not shown in the engraving, was an option to fit over the outside of the cylinder(m). This was designed to be removable and served to allow observation without interference from ones breathing or the wind, rather than restrain the subject inside. In contrast to this outer glass covering for the Deleuil microscope, the 'seed microscope' had an interior glass cylinder which was closed at the bottom. Some examples of the 'seed or insect' microscope also incorporate a glass disc on the bottom which can act as a compressor. The 'seed' or 'cage' microscopes pictured on this web site are certainly not of the same caliber as the Deleuil microscope described by Raspail. They have one low powered eyepiece and no movable stage. Unlike the instrument pictured by Raspail, the inside surfaces of the supports are not threaded on these instruments. They do, however, have a few features in common with the Deleuil microscope. They were, like the Deleuil microscope, designed to allow light to enter from the sides, for better visualization of opaque objects, they can attach to the top of the cylinder as a stand or handle, and they do pack away for storage upside down inside the cylinder. Also, like the Deleuil microscope, the eyepiece has adjustable focusing. These 'seed' or 'insect' microscopes were inexpensive devices intended for very elementary studies, not the more versatile (and more powerful) instrument like that used by Raspail. 1. Harris, Henry: The Birth of the Cell p 32. Yale University Press, New Haven and London, 1999. 2. Weiner, Dora B: Raspail Scientist and Reformer pp 91-94. Columbia University Press. New York and London. 1968. This book includes images of Raspail's personal microscope and critical information about its components. It has an error in interpreting the advantage of Tourmaline however, claiming that its polarized light characteristics lessened aberrations; in fact it is its refractive index higher than glass that imparts this advantage. 3. Nouveau système de chimie organique, fondé sur des méthodes nouvelles d'observation. Tome 1 / par F.-V. Raspail... - 1838. 6. See, for instance, Bonnet, in the 1838 London Medical Gazette, and The American Journal of Pharmacy Vol 9, p225, 1839, and many others of the period. This type of microscope continued to be called 'Raspail's Microscope' even in books as late as 1877 e.g. Phin, J. Practical Hints on the Selection and use of the Microscope 2nd Ed. 1877 p27.